Starting your own business is scary and involves lots and lots of hard work. When you first get started, all you have is your idea and your determination to succeed. You must create everything else along the way. In order to build self-confidence and strengthen their concept, most people reach out to friends and family to get input and hopefully find some support. However, these requests for support are often met with pessimism and discouraging feedback ranging from legitimate “constructive criticism” to just plain old criticism. While all feedback should be taken into consideration, it’s important to understand that the decisions you make are yours alone, and no one is more qualified to make them than you. If this concept worries you, I’ve got some good news. You’re in good company. The world is filled with extraordinarily successful entrepreneurs who were told that their ideas wouldn’t succeed or that they didn’t have the time, talent, or resources to be successful. In order to show you that this isn’t just a theory, we’ve launched a series of interviews with entrepreneurs who have succeeded despite the naysayers. These aren’t the “outliers,” who are so rare that people write books about them. These are just ordinary people who set out to start a business and who have found great success despite the fact that the people around them told them they couldn’t do it and shouldn’t even try. Before you launched Cheekd, you were a NYC-based architect. Tell me a little about your work as an architect and how you felt about it? After graduating from the University of Kentucky in 1996, I moved to New York City and started as a sales assistant at a furniture company. Over the next 15 years, I climbed corporate ladders in architecture, furniture, and design firms, making my way to a six-figure income. I worked for firms such as Goldman Sachs, Vitra, and Christian Dior. For an architect, I managed to land some pretty fabulous, high-profile positions that flew me all over the world. This allowed me a life of shopping, dining out, and traveling—like it was actually my job—but it never lead to happiness. My days in the corporate world felt like time was standing still. No matter how many mornings I’d find myself in trouble for being tardy, I would show up at work 15- 20 minutes late and have my bags ready to jet out the door at 5:59pm. I despised the idea of working 40+ hours a week to start what felt like “living” at 6 p.m. I wanted to live to work and create a lifestyle instead of a “job,” and that’s exactly what I’d set out to do. During my career, I was constantly coming up with ideas to build my own business, but none of them were powerful enough to ultimately take the leap. Until one night at dinner with a colleague, I came up with an idea that took online dating to a new level. My belief in this new concept was so wholehearted that I quit my job and traded in the world of bricks and mortar to pursue my new passion — building relationships. Miraculously, I’m now working all the time because I love what I do! Tell me more about when and why you decided to leave your career as an architect and launch not only a new venture but a new concept in mobile dating apps? Cheekd was born because of a lucky pickup. One night in February, 2008, I’d had dinner with a friend and colleague. As we walked out of the restaurant, my friend scribbled “Want to have dinner?” on the back of his business card and slipped it to a woman he found attractive. He landed a date. I landed the idea that transformed my life forever. After nearly two years of brainstorming how to remove the “business” from the business card, I launched Cheekd—an intriguing and provocative set of business card-sized introductions used to engage a romantic prospect when feeling awkward or shy—or simply desiring a new approach. 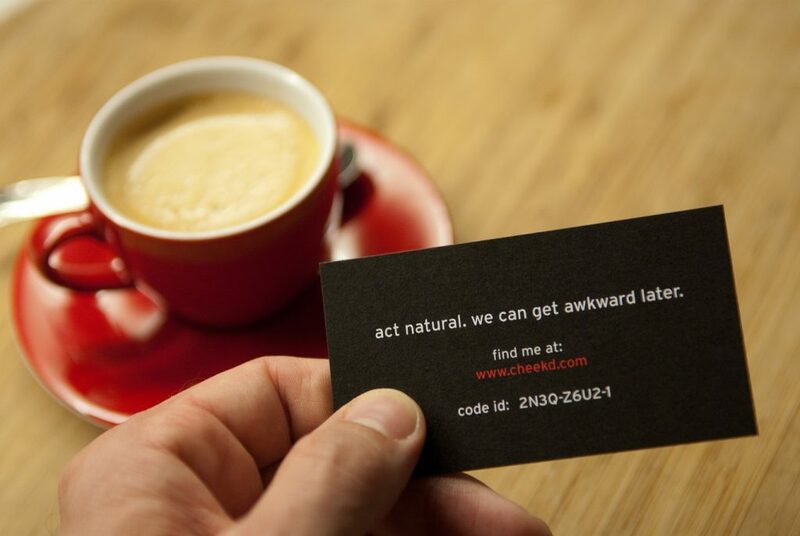 Cheekd users could express their interest in someone by coyly handing them a small black card that contained a cheeky phrase such as “Act natural. We can get awkward later.” or “I just put all my drinks on your tab.” The recipient of the card would be invited to go online to check out your profile and decide whether he or she would like to make contact with you through the Cheekd internal messaging service (Personal information and privacy are protected). A few months later, we popped up on the cover of the Styles Section of The New York Times: “Move over, Match.com, this is the next generation of online dating.” A couple of days later, I got a call from Oprah Winfrey’s Studio asking for an interview. I knew I had gold in my hands. I left my job and started working full time on Cheekd in November, 2010. 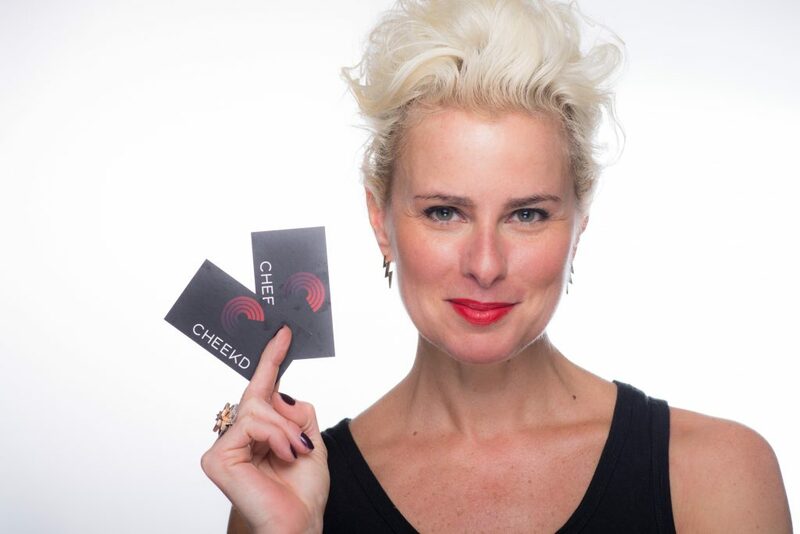 Soon after, Cheekd went global with customers in 47 states in America and 28 countries internationally. Tell me about your passion for Cheekd. I’m a hopeless romantic, revolutionizing the world of online dating by introducing real world social interaction back into the mix. I know it takes guts to put yourself out there—whether you are trying to work up the courage to approach a perfect stranger or start something from scratch—and put it all on one card, in broad daylight for everyone to see your struggles, your mistakes, your learning curve. It’s the fear of rejection, the fear of humiliation that holds most of us back. Fueled by an incredible self-belief and perseverance, I am a walking example to the entrepreneurial world that you have nothing to loose by jumping over your own shadow and being true to yourself. We only win, for all we ever wanted in life is on the other side of fear. In 2013, you appeared on Shark Tank and were rejected by all five investors! I’ve read some of the things those investors said to you and they were pretty condescending and harsh. For instance, Kevin O’Leary told you to quit your “hobby” and shoot your business like a rabid dog? Wow! Tell me what it felt like to hear that? The truth is that I didn’t actually believe I’d walk out of there with a deal…Really, I didn’t. What I did know was that if my episode got selected to air, 8 million people were going to know about Cheekd and how determined I was to see it succeed at all costs. I was a little worried that the outcome of the show would tarnish my brand but knew there was no chance I was about to quit. I remember walking off the stage and straight up to the producers of my segment and telling them I’d hoped it was “bad enough for television.” Good or bad, I’d worked hard to get that coveted spot in the tank and I wanted it to air no matter what. I knew there might be other interested investors and potential customers. I’ve always been a major proponent of “all press is good press” and airtime on that show is apparently worth nearly 8 million ad dollars. I really had nothing to lose. Although those final bold words of mine ended up on the cutting room floor (adding insult to injury), in the 48 hours after the broadcast, Cheekd.com received a record breaking 100K unique visitors and our inbox filled up with thousands of emails insisting that the “Sharks” were “out of their minds” for not investing. How did you overcome the Shark Tank criticism and subsequent financial struggles? The Sharks didn’t really offer any constructive criticism or suggestions other than to “quit my hobby.” Barbara Corcoran said I was the “right entrepreneur with the wrong idea.” I heard what they said and I moved forward. Whatever hole I’d crawled down, I fought twice as hard to come out above. Since the Shark Tank aired, I found the missing link from years before. After shuffling around equity, I’ve gotten a CTO on board who’s helped facilitate and finance the face and technology behind the new Cheekd. I ended up raising over five times the amount I’d sought on the show. 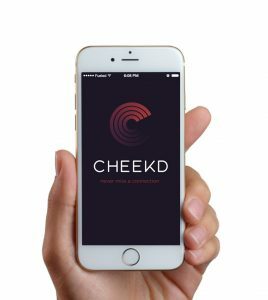 Our newly-launched app allows users to solve missed connections with a technology that was not available when the patented Cheekd idea was launched in 2010. It was only a matter of time, and I’m thankful I didn’t take the Sharks advice to quit and move on. My episode has re-aired about 30 times now. It’s like the bad gift that keeps on giving and every episode sends thousands of views to the new version of our business which leads to app downloads all over the world. You must have found support for your idea somewhere? Who supported you and what was the thing that people said or did that helped you feel most supported? My friends and family … surrounding myself with supportive friends and family during my entrepreneurial journey has really helped keep pushing me forward. It’s been an intense struggle and I couldn’t have made it this far without these amazing people cheering me on to the finish line. How do you feel about your decision to launch Cheekd now, and what would you like to say to the naysayers? Cheekd has been the most powerful thing that’s ever happened to me. Building this business has been an incredible learning experience. I’ve taken a major risk (both financially and mentally) and surrendered my career in architecture and design, but my heart and mind are in this project every waking moment. I’ve never been more dedicated to anything. Despite the occasional overwhelming stress, it’s been loads of fun. I feel like I’m living the American Dream—I’ve given birth to an invention. It’s the most rewarding feeling. What advice would you give to people who want to venture out on their own and follow their dreams but are getting lots of push back from those around them? There are a few good reasons why you should quit your job and move on: First, you’ve come up with an idea that you are insanely passionate about. Second, you are tired of building someone else’s dream instead of your own. And third, you’ve got the relentless perseverance and dedication to bring your idea to life! Entrepreneurship is being on a mission where nothing can stop you. It will take twice as long as you hoped, cost much more than you budgeted, and prove more challenging than anything you ever tried. But if you give it your all and refuse to give up, you can trust it will be the ride of a lifetime. My advice to other aspiring entrepreneurs is to be brave and follow your instincts. You can’t cheat the grind, but if you give it your all, you can trust that the payoff will be worth it.